Our expert guest this week is Dr. Chad Cook who is the Program Director of the Doctor of Physical Therapy Program at Duke University. He is a tenured professor, a clinical researcher, a physical therapist, a professional advocate with a long-term history of clinical care, excellence and service in the profession. His passions include refining and improving the patient examination process and validating tools used in day-to-day physical therapist practice. Presently, Dr. Cook is part of over $7 million in federal funding and has published over 245 peer-reviewed papers. He is an international speaker who has won multiple awards for teaching as well as research. He’ll be speaking about psychologically informed care in pain care as well as physical therapy. On this episode, you’ll learn about Dr. Cook’s professional evolution, which in commerce is a clinician, researcher and educator. Why psychologically informed practices are so hot right now? Why the effects of psychologically informed care are perhaps low? Do we need more studies on psychologically informed pain care? Why the current literature base is perhaps biased? Should we drop psychologically informed care for more lifestyle interventions? Last but not least, why pain mechanisms are important for every pain practitioner to understand? Dr. Cook has had a long career in physical therapy which spans both clinician as well as researcher and as well as a university professor. 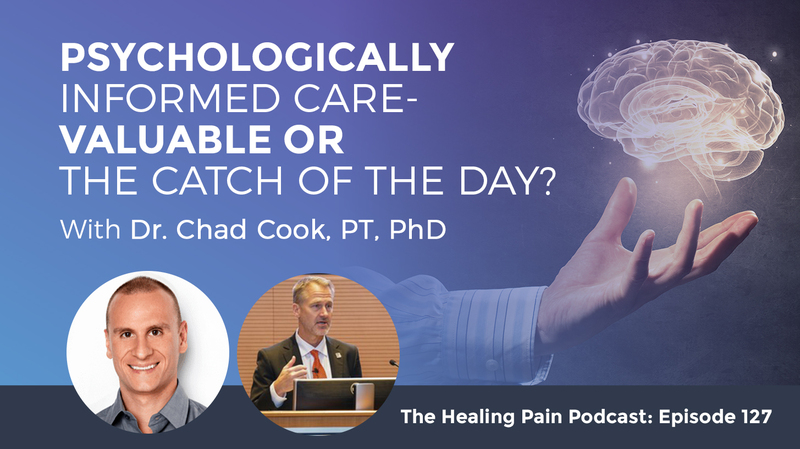 He’s able to talk about a number of important topics with regards to physical therapy and pain care that will benefit both the practitioner and someone with pain. Chad, welcome to the show. It’s great to have you here. Joe, it’s great to be here. I’ve been looking forward to this. I’ve interviewed a bunch of other professors and physical therapists at Duke, so I’m excited to have you on the show. I know you are doing great research down at Duke and you’ve got a strong physical therapy program. There are lots of great stuff going on. We’re going to talk about psychologically informed care, which is somewhat all the rage in physical therapy. There are some good reasons why it should be. Tell me a little bit about your background. Maybe give me a brief overview of your career path so we have a little background about who you are and the type of things that you’ve done in your career. I’ve had an interesting career. I’ve been a physical therapist for several years. About nineteen of that, I’ve been in an academic setting where I have bounced back and forth from being more of a clinician to a researcher-teacher mix. I’ve always specialized in orthopedics but early in my career, I focused on manual therapy. A large portion of the research work I’ve done is on manual therapy. In about a couple of years ago, I identified a deficiency in my training with respect to psychologically informed practice and understanding pain science. Having been a clinician for 23 to 24 years at the time, I thought I had a good perspective on management, but I recognize that I had that weakness. I studied at McGill. I did a two-year pain certificate program. We were lucky at Duke because we have Frank Keefe. I work with Steven George on a couple of projects. I’m on a very large grant with him in which we’re building out a psychologically informed practice arm of a large trial. I’ve learned from the best. It has upped my understanding of this particular topic quite a bit. I know Steven George. He’s got some great research. He was on the show twice talking about psychologically informed care. He has some great research in PTJ, Physical Therapy Journal. Are the effects of psychological care something that we should be paying attention to? We know that psychologists thought of that. That’s what they do 100%, but what does the evidence say for the impact or the effects of psychologically informed care? Wholeheartedly, yes. It needs to be embedded into our clinical makeup anecdotally day-to-day working with our patients. We understand the value in giving information to patients and empowering patients in motivational interviewing and all of the components associated with that. If we look at trials of whether it’s performed by a psychologist or a non-psychologist, the effects or the strengths or the magnitude of that intervention is small to moderate with respect to spinal care. There’s more research in the area of spinal care. There’s also research outside of my knowledge domain on things such as weight loss and other things. I focus more on the spine. That tends to be where I live with my research and funding experience. The effects are small to moderate, which is also typically what our effect sizes are for other interventions outside of this particular focus. You sent me a paper from The Spine Journal. The paper is called the Effectiveness of Psychological Interventions Delivered by Non-psychologists on Low Back Pain and Disability: A Qualitative Systematic Review. It’s by Geoff Bostick. He’s a physical therapist from the University of Alberta. There is a little bit of research into this. When you say there are small to moderate effects, we are too excited about psychologically informed care then if they’re small to moderate effects. First of all, thanks for having me on to talk about this. I also want to talk about it in a bigger viewpoint because I love what you do and who you bring on. You bring on people that touch on all of the things that influence the health and recovery of a patient. You have nutrition, exercise or lifestyle modifications. Those are things we can’t discount in affecting the individual’s recovery process. We can’t discount their mental state, their cognition, their mood and all of these components, which all in a large package contribute to the outcome. As a physical therapy profession, we tend to be a bit bandwagon-ish in which we want to jump on with the next silver bullet intervention. I will be the first to say that this should be mandatory training for everybody because it does augment the care process of a patient. In some cases, it is the primary reason why people improve, but not for all patients. There’s great value there, but are we pushing it too hard? Are we discounting other approaches with the assumption that all we need to do is follow a psychologically informed practice? I would argue that maybe that’s the case. If you spend a little bit of time on Twitter and you can’t gauge the world through Twitter goggles, but it’s a good place to look at the dichotomy of how people think about interventions and how we discount things that we’ve done for a long time. There may be pain modulatory that now are promoting other things. We need to watch out with that and maybe a more legitimate reasonable understanding of what things can do. Some practitioners who follow me are a little confused by it. They’re like, “You had someone talking about exercise and you had someone talking about nutrition.” For a practitioner, it can be quite difficult because in some way, our education and our healthcare system are still siloed. When you go to school for physical therapy, what you’re going to learn is exercise and manual therapy. We do have some psychologically informed care in our doctoral training programs now in the US, but not to the level it needs to be. We have a smattering of nutrition in there also, or what’s called health promotion. Practitioners say, “How do I start to fit this in? How do I translate the knowledge?” Knowledge translation is one of the things that we struggle with the most right now when it comes to pain. Do you think the studies that we have out there for psychologically informed care are strong enough? Do we need more studies on them? Bostick’s paper recommended more and stronger studies. He found a number that had a reasonable risk of bias. If you’re using a risk of bias tool and you find something that has a moderate to high risk of bias, it’s got some bias built-in to it. The research thing that we can always have better studies. There always needs to be a better study. What we need to do is to look outside of this particular paper too and look at what the psychologists have found. The results that Geoff outlined at his systematic review is a platform. It takes all the studies and it looks at them and it gives some perspective of the effects against reasonable operators, whether that’s manual therapy, it’s exercise or it’s typical care. All of those were compared to groups in the study. Knowledge translation is one of the things that we struggle with the most right now when it comes to pain. All of these have a shared mechanism and tend to show very similar outcomes and studies regardless of who incorporates it. I’m not sure more research is going to show anything different. They and we have done a lousy job at the patient selection. As a clinician, there are some people that you’re working with that you are like, “I don’t need to spend heaps of time talking about their pain. We’re better off of what we do next.” There are selected candidates that if we put them in a trial and we compare it to psychologically informed practice versus some other approach, you’d see a larger effect. We haven’t distilled that out well yet. I want to go back to something you mentioned with regards to shared mechanisms. I’m not sure if everyone understands what that means. Can you articulate that a little deeper? Everybody’s response to exercise physiologically and psychologically is different. The way that they modulate their pain and how things change within their body, everybody responds differently. The interesting thing is that, regardless of what approach you use, there seems to be a shared mechanism in which everybody responds quite similarly. Whether you do one particular approach versus another, the outcome and how it influences a patient outcome measure tends to be about the same. This was first robustly reported on in the psychology literature in which they started noticing that it didn’t matter. Psychologists are a lot like PTs. They like the packaged products, “This is a particular form of Cognitive Behavioral Therapy. We’ll call it the adaptive model or whatever.” All these different packages all had the same effect. They all had a positive effect, but they all had a reasonable or shared effect. In other words, we don’t know the exact way that it is consumed by the body and it affects the individual, but it seems to be a shared way that all roads lead to one particular place. It’s interesting how the psychology profession is able to package things. PT hasn’t always been like that, but we’ve reached that point now as well. When we look at psychological and informed care, that umbrella topic is a lot of different things as well. It could be CBT. It could be ACT, Acceptance and Commitment Therapy. It could be mindfulness, “explained pain” or pain neuroscience education. I had Lorimer on and I said to him, “Is explained pain a form of CBT?” Previously he would have said no, but now he’s at the point where he’s like, “It is.” We’re working on thoughts and cognition and how it affects someone’s behavior and looking at what the outcome is. Do we have any idea from a physical therapy informed perspective? Do we need a two-hour cognitive intervention? Do we need seven visits? Has that started to percolate up in the research at all? No, we don’t know the right amount. We don’t know the proper dosage. We don’t know the intensity. The other thing that we don’t know are the right candidates. We don’t know which cognitions or moods we should focus on explicitly. We do know that if behaviors are altered, then you’ve got something to target. Some of these other components are considered dosage-related. The literature still blocks an understanding of that. Even Geoff talks about that and the systematic review to that. It was a Jackson Pollock painting with respect to all the different studies, all the different approaches, all the different sample sizes, all the different patient backgrounds and clinician backgrounds. It was a big mess, which is one of the reasons he elected not to do a quantitative assessment of it. He kept it qualitative. I don’t think we’re there yet. I don’t think we completely know it. If you talk to an ACT therapist, they have something called cognitive fusion. It is their version of cognitive restructuring, which is what a CBT therapist uses. An ACT therapist will argue with you that the reason why a cognitive intervention works is not because you’re restructuring thoughts, which is typically part of a CBT model, but for other reasons. What you’re saying is that there are so many different processes happening at once that we can’t identify which process is exactly working. We have a hard time identifying which processes with which patient population. For the right candidates, it works. Instead of the average clinician beating themselves up on how does this work, let’s fuse it to what we do. Let’s focus on other things as well such as lifestyle medicine and whatever pain modulatory components might be useful for that patient. Have we gone too far in physical therapy or physiotherapy with psychologically informed care? I’m going to say no. This is my interpretation and I may be completely wrong. What we’ve done is, we’ve created the straw man and called it psychologically informed practice. With respect to understanding how to implement it and the right mechanisms associated with that, that is the piece that we haven’t done well yet. Lorimer and Peter Sullivan interact with the patient with a built-in skill set. They applied a portion of psychologically informed practice that is indeed a skill. I’ve watched Frank Keefe interact before and I can’t do that yet. It is such a high-level skill that takes years and years of understanding and reflection and knowing how you’re coming across to the patient and what you’re saying and how you’re interacting. I don’t think we’ve gone too far. The right type of training needs to be more applied, needs to be more longitudinal, needs not to come from papers, but from actual legitimate workshops where you interact with people who have chronic pain. Those pieces will be more meaningful training-wise than anything. Taking your skill and then honing which anything in all of our professions takes decades or years to hone those skills. We have so many different types of skills that practitioners are somewhat playing/struggling with because they’re trying to integrate them all in. The term psychologically informed care, should we maybe adopt a different term? We do know that most patients don’t necessarily like the idea of going to psychotherapy for their pain because it makes them feel “crazy” or they have some psychopathology. We’re reading the research, we’re seeing that there’s a place for this in our practice, but should we start to maybe call it something else or create a new term for it? One of the codevelopers of that term works here at Duke so I have to be cautious about that what I say. No, there is negativity associated with that, which there shouldn’t be. I worked with my colleague in Canada, Yannick Tousignant-Laflamme, we call it cognitions and mood more than psychology. There’s a balance between a person who has a legitimate DSM-IV or DSM-5 criteria psychological problem versus cognitions and mood which are very malleable. Which are highly related to a person’s pain and their feeling and disability. Those things are very adjustable. Terminology-wise, what’s the best thing? For them, something besides psychology would be better because they don’t want that tagged to them. I’m not sure. It’s been somewhat positive because it’s easy to remember that a lot of clinicians are at least recognizing the value associated with that. The takeaway is that they’re taking some of the pieces with them. I’m going to have to marinate on that one a little bit. How have you started to translate some of the literature on psychologically informed care at Duke University in the PT program there? Is there one particular course? Is it part of a course? What does it look like? If behaviors are altered, then you’ve got something to target. We have redesigned our curriculum which will initiate the new rollout in August of 2019. We have a course on pain science. It’s a full two credit hour course in the first year and in the second year, for those that are interested, we’re building specialty tracks into our curriculum. I’m not sure if anybody is doing that. The person has the opportunity to go down the pain science specialty track and receive additional training in an applied skill set in psychologically informed practice. Education-wise, we have taken it seriously and we bumped up. We’ve talked to our neuroscience educators to improve the way that we teach about pain and what pain is, not only pain mechanisms but the pain experience. We’re going to burn to our better understanding of how individuals may experience their pain that is not purely biological but to also have that biological background. What are the tracks that you have there? We’ll have ortho, we’ll have PTs and we’ll have neuro. We have a management complex patient track and there’s one more other research. We have short tracks, which consists of two to three courses where you can take multiple short tracks along the way as well. I’m thinking of FSBPT perspective, are there questions on the boards that are starting to show up that would steer programs to including psychologically informed care into their PT curriculum? I’m not sure I can answer that. I know that the questions are often a few years behind what the major changes that you typically see. I don’t think I can give an educated answer on that one. You could be ahead of the curve there at Duke. I think we are. I always have a soft spot for family practitioners because they have to be the jack of all trades. They have to recognize everything that comes their way. It’s a pretty high expectation of a professional body, but we’re not a whole lot different than that. You can drop us in anywhere and we can manage neuro and PTs and ortho. The complexities of care have gone to a point where that may be asking a little too much. I’m a believer in specialization. I know that not everybody supports that, but I think we do it too. Does that mean that you’re not a proponent of primary care PT? Can you still specialize and wind up in primary care physical therapy? If you think about it, the majority of the patients that you’re going to see are going to be a musculoskeletal base. Keep in mind too that at our new curriculum, the first fourteen months of the curriculum is standard foundational physical therapy. You’re still going to get everything with that. The specialty tracks allow a person to do a deeper dive into something. The majority of the patients that we see are a musculoskeletal base. If it’s a primary care physical therapist, one of the top choices for the first provider from musculoskeletal problems. I pushed that on this show all the time, not because we’re the only professional that can do that. There are other professionals out there that can do it. Chiropractors are being one. I do think we need to push the profession in that direction very aggressively. I love the fact that you’re looking outside of just being a physical therapy homer. It is true that chiropractors also support that they also prevent a lot of downstream negativity associated with too much care or over-medicalization and a number of other things. We’re one of them but other people can do that as well. I want to backtrack a little bit to the psychologically informed care. When you think back to your peer-to-peer interactions with psychologists, how do they feel about physical therapists using this in practice since this is what they go to school for? It’s important for clinicians to recognize that they do not have the skill set through Gestalt and identify that with a patient. There are two levels when it comes to a psychologist with respect to their training. There is a ceiling on what we do. We’re trained this way too when we work in our studies with the psychologist because on our grants, we have the psychologist. Whenever you’re dealing with someone that has borderline suicidal tendencies or significant diagnosis of mental health disorder, that’s beyond our scope. What they train you to do is recognize when somebody is beyond their scope. They also train you to recognize how you can augment your care with appropriate psychological informed practice. They’ve been completely open about doing that. Initially, you would think, “This is a turf thing.” I don’t think they see it that way. They see it as an outreach in improving the care of the population without worrying about losing a patient population. I don’t think they’re seeing those patients anyway. The ones they’re seeing are the people who have the additional skills for that will certainly go. It’s important for clinicians to recognize that they do not have the skill set through Gestalt and identify that with a patient. You have to use standardized scales. You have to use tools that had been validated in the literature. I don’t know the author, but I read a paper a while back where they studied whether PTs or OTs could identify those individuals that had a serious psychological complication. Majority of the time, they missed it. I don’t even try to fool myself into thinking, “I’m good at this. I can identify that that person has some serious problems.” When in doubt, the next thing you do is you ask the patient, “Are you interested in care beyond what I can provide to address X, Y and Z?” If the patient is giving you, “Yes, I am interested.” I think that’s definite. Move them on to the appropriate provider. I’ve referred patients to psychologists who I just start to work and realize, “This is a barrier. Are you interested in exploring this on a deeper level? This is a big impact on your health and your pain right now. I know someone who can help you on a deeper level.” A lot of patients are very open to it. They’re open to it because they’d been with the PT twice a week for four weeks. The relationship is there and that barrier or that stigma of my thoughts and my mindset, they do have an impact on pain. There’s a good synergy that PTs and psychologists can have. That synergy does happen in inpatient multidisciplinary environments, but we don’t have a lot of those in the US. Most of what we’re doing now is an outpatient in our own specific outpatient environment. If you look at the comparisons to other countries and where the money goes and supports, we are so low on an interdisciplinary or multidisciplinary setting. We just don’t see that very often. This is almost out of necessity that you train up those individuals who can also touch on some of the other lifestyle characteristics for that full holistic approach. We’re lucky as a professional to fit as that provider. The idea of competition and barriers blows my mind because, in the country we live in right now, there are so many people with chronic disease and diabetes. We can go down the list of all these different conditions that we know. If you feel that there’s a scarcity of patients to treat, you are either not reading research or you don’t know how to market. That’s just the way I look at it. Your intervention or your shtick, you know in your heart has no value. If that’s the case, you’ve got to rethink of what you’re doing. I do believe that if you have value, people will seek that care and you can justify what you’re doing with patients. That’s an essential piece. I have a nutrition course now and people were asking me, “What about an RD?” I say, “An RD is a licensed healthcare practitioner that has a critical role in managing people’s health. RDs primarily function in the realm of medical nutritional therapy.” My perspective is that since nutrition is part of our scope of practice in PT, let’s work with patients on nutrition education. 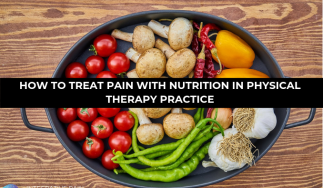 We can prevent them from getting to the point where they need medical nutrition therapy, which is typically in an inpatient environment and people are much sicker. We need to work especially us, PTs, we’re the optimal non-pharmacologic profession to work on all these things. What do PT/PhD trained professionals in the US need to do to improve our literature-base on pain education, pain management or whatever you want to call it? The answer might surprise you a little bit. I’ve got some recency bias. I was at the JOSPT editor’s meeting and I sat next to Tim Flynn who is a big advocate of psychological informed practice and just providing the best care for patients that you could possibly give. We were all spitballing, “What do we need? Where’s the gap in the knowledge? How can the journal help support that knowledge?” I suggested pain mechanisms and the biology of pain that the majority of clinicians still don’t truly understand. It’s not pain experience. We’re starting to catch up on that and realize that it’s influenced by a number of factors. 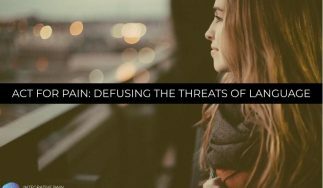 The actual biology of pain and how that can be modulated through physical means as well as psychological needs. We’ve almost discounted the physical part of it. What’s an inflammatory process? What’s the pathway of pain? How can that be modulated through exercise? What things are analgesic that a person can do? Somehow, I don’t think our training is robust enough on that. I read a wonderful quote from Hopin Lee. He’s an author. He does a lot of causal mediation trials. In their particular causal mediation design, they looked at the influence of psychology and the overall pain experience. 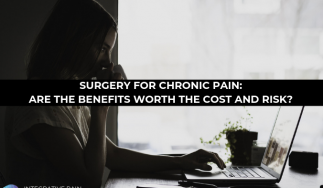 I don’t remember the actual percentages, but it was a small percentage and he said, “This opens the door to identify other contributors to the person’s pain, for example, biological mechanisms of pain, inflammatory processes, etc. Those are there and we’ve discounted those and all of our interventions that can modulate those. It’s a great point that no one has put up in this show. Lorimer’s work explained pain where he has taken that pain biology and he’s simplified it. It’s important because there’s a gap in literacy in the practitioner as well as someone with pain. I also think to myself, “He’s so brilliant at teaching that because for years, he studied the actual neurobiology of it where we’re coming at a different point.” Most of us have some background in anatomy, physiology, pathoanatomy, pathophysiology, neuroanatomy and neurophysiology, but not to the extent that he does or other people out there have. Your point is well-taken. We need more of the basic science behind it. Also, the basic science of why exercise is pain modulatory. If you would grab the average clinician and say, “Why is that the case?” They would struggle to be able to answer that. It shouldn’t be at the tip of our tongue. This is what we do. There is a gap in our knowledge and in our education right now and it’s a legit piece of why we improve patients and their recovery process. If you had the eloquence of Lorimer Moseley in front of the patient, explaining to them how exercise is pain modulatory and it also is helpful for this physiologically and lifestyle medicine-wise, this is what you can expect. The interesting thing is we draw all these students in with exercise science degrees and undergraduate. When they leave school, their number one complaint is, “I don’t know how to package an exercise program or how to explain that exercise and the necessity of it to my particular patients in front of me.” There’s a gap. Somebody is going to say, “This guy is old school. I can’t believe he’s still talking about that.” Let’s face it. That’s a gap in our knowledge and in our education right now and it’s a legit piece of why we improve patients and their recovery process. I have employed many physical therapists and after about three years of being in practice, I realized they don’t fully have the background in an exercise that they need. You would think, “Wouldn’t be the case?” I had to create a mentorship training program for new therapists coming in out of school and say, “Here’s a good framework of what you can do with the following diagnoses.” I would cover back pain, knee pain and of course, we have our post-surgical protocols. Those are already set by the surgeons. That’s missing too. All those mechanisms start to relate. Do you have a pain mechanism as part of your program at Duke? We do. We’re looking into bumping that up as well and we’re going to embed that to the pain science course. Lucas Research has informed a lot of that, which is good for PTs. Chad, it’s been great chatting with you. Can you tell everyone how they can learn more about some of the research that you’re doing and great things you have going on at Duke? If you want to share any website URLs, Twitter handles, please feel free to do that. First of all, I enjoyed this. Thank you for giving me the time to talk. I’m halfheartedly on social media, but I’m @ChadCookPT on Twitter if anybody wants to follow me. Whenever there’s something useful information that comes out, I like to post it and get comments from people. I’m also with a group called Duke MSK and the Twitter handle is @DukeMSK. It is a group of us, Steven George, Corey Simon, Adam Goode, Maggie Horn and a lot of researchers here at Duke that are with the Duke Clinical Research Institute. We generate a lot of research trying to do a better job in taking care of patients with musculoskeletal pain. You do a great job at Duke. There are lots of great research coming out of there from lots of great PTs. I want to thank, Chad, for being on the show. You can tweet out to him. At the end of every show, I ask you to share out this great information with your friends and family on Twitter, Facebook, LinkedIn, your favorite Facebook group or wherever you’d like to share information about pain and pain management. Thank you very much and we’ll see you all next time.